So, as a request from Chris, the lovely dude who brought me nail polishes back from India, today's nail art utilizes 2 of the Indian polishes!! :-D I wanted to do something abstract and decorative, and this is what I came up with. I think it's kind of a different twist on a moonicure. I used Lotus Herbals Luscious Berry as a base, with Lotus Herbals Orchid Pearl for the design. I used Essie Matte About You over the tips to make them a tad more matte than the 'moon'. Especially love the ring finger. This looks like bead netting. Did you see the new OPI ds polishes yet? I reviewed them and LOVE them, but I haven't seen anyone else post about them yet- figured you would have them already maybe. they're not out yet I'm DEFINITELY broke too OPI sent them out. I think you'll like ds magic when you see it. I loved it! Very beautiful! Lovely dude, that's awesome. I am a lovely dude!! Nails look killer my dear. Very smart yet soft, too. Nice! It's amazing that your blog! 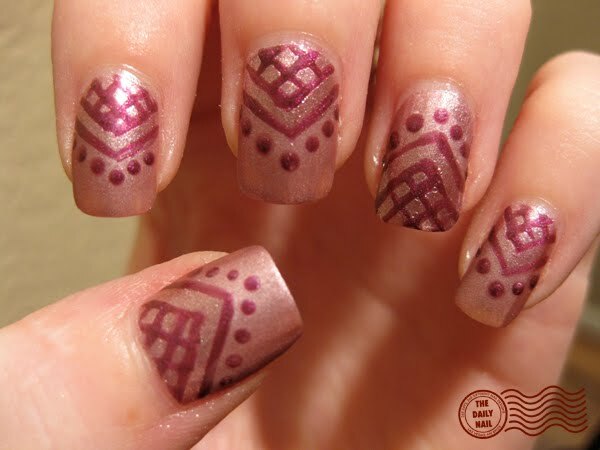 It was the best blog of nails I have ever seen! Congratulations ... you're a great artist! I admire your work too. did you see you made top 50 best nail blogs?